1. MP4 is a container format, which can be encoded by scads of different codecs including H264, MPEG-4, H265, MPEG-2 Part 2, MPEG-4 ASP, etc. 2. The video codecs supported by iPhone iPad are only H264, MPEG-4 and HEVC. As for Android, the compatible codecs are H264, MPEG-4 SP, H263 and VP8. Therefore, the key is not the file extention format .mp4, instead, video codec does matter a lot. And if you wanna convert MP4 to one video codec that is compatible with most of your mobile devices (iDevice or Android), then H264 is the primary choice. This MP4 codec is supported by most devices, platforms and services. Consequently, based on the above mentioned reasons, the current best choice is to convert MP4 to H264 codec for better compatibility. To Free Convert MP4 to H264, How about this? Now, you're in the times of network information. You can access to almost any information you need. And a MP4 to H264 converter is also of no exception. Hence, we can deduce a conclusion that you're supposed to know a thing or two about free MP4 converter. Here is our presumptuous request that if you can carve out some precious time to express your suggestions on our free MP4 converter - MacX Video Converter Free (a free product to free encode MP4 videos in H264 codec, as well as MPEG-4, H265, H263, VP8, VP9, etc. 320+ video codecs) and point out where we need to improve to make it better. Any of your suggestion will be sincerely appreciated and taken seriously. We want to hear the voice from you. Thank you. Step 1: Click "Add Video" icon at the top-left corner to import MP4 files into this free MP4 converter after you free download MacX Video Converter Pro on macOS or Windows PC. 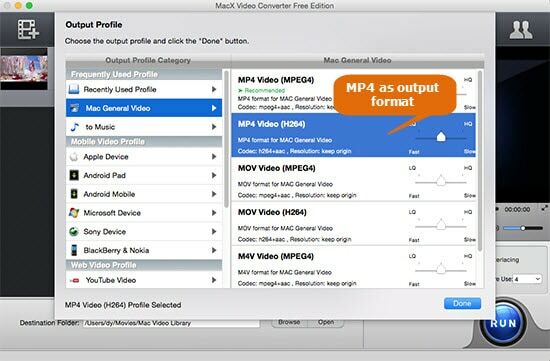 Step 2: Choose "MP4 Video (H264)" from Mac General Video as output format. You can also convert MP4 to MOV, H265 to H264, H264 to MP4, MKV to MP4, MOV to AVI, etc. 180+ video and 14+ audio formats. 1. To get highest possible quality, click setting icon to turn up video parameters, like adjust frame rate from 30fps to 60fps, change video resolution from 720p to 1080p or 4K 2160p, etc. Plus, move the slide bar from LQ to HQ (shown on the right-hand picture) to improve quality. 2. You can't have your cake and eat it. You need to spend more time on conversion if you pursue higher output quality. Step 3: Click "RUN" to start to encode MP4 to H264 on Mac or Windows. On top of the above recommended free MP4 converter, you can also take your VLC media player into consideration if you don't want to download any MP4 to H264 converter software to consume your computer memory. VLC player not only plays an important role in video audio playback field, but only performs a crucial part in converting video on Windows and MacBook/iMac/Mac Mini. How to free convert video from MP4 format to H264? The process is easy peasy. Step 1: Fire up VLC player on your Windows, MacBook Pro, MacBook Air, iMac Pro, Mac Pro or Mac Mini. Step 2: Tap "Media" on the top main banner > click "Convert/Save...". Step 3: Click "Add" option to import MP4 files into VLC media player. Choose this MP4 video and click "Remove" if you choose the wrong file. Step 4: Hit "Convert/Save.." at the bottom right corner of the interface. Step 5: Choose "Video - H264+MP3 (MP4)" as output format under the "Settings" profile zone. Step 6: Tap "Browse" to select a destination file and name the output H264 file. Followed by a press on "Start" button to begin converting MP4 files to H264 on macOS or Windows. Feel free to send feedback to us about your user experience about these two MP4 to H264 converter software. Alternatively, you can directly comment on the below comment zone to talk about your opinion. Of course, you're warmly welcomed to share with us about your own useful solutions on MP4 to H264 conversion. There is high likelihood that someone in your local city, your country or in the whole globe just exactly needs your special idea. Free download this professional MP4 converter to encode/decode MP4 format to H264, MPEG-4, HEVC, H263, as well as MKV, MOV, AVI, FLV, WMV, AVCHD, MTS, etc. 320+ video codecs and 180+ video formats. Share your user experience after you trial on MP4 to H264 conversion.